Take Exit 179 off I-20, drive north on to AL-202. Ga about 2.5 miles. Turn Left onto Bynum Blvd. and go about 2.3 miles. You will see the large Anniston Army Depot sign on your right. Turn Right at this sign onto Victory Drive. Continue straight ahead to the installation checkpoint. After clearing security at the gate, continue straight ahead and take the first right turn (Ayers Drive) IMMEDIATELY after the gate. Drive straight ahead til the road T's (in front of Bldg 251), turn right. Drive a short distance turn left in front of Bldg 221. Turn (stay) right at first street and drive directly into the RV park. Must use General Delivery in Anniston, AL. All vehicles are subject to search. Cable TV available at all sites. jhbridges reported that as of his stay on 22-23 SEP 17 "Small campground, 11 spaces of which eight appear to be homesteaders." 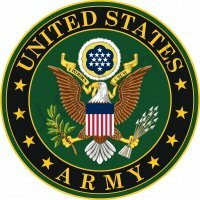 We had hoped to spend the night of 10 Aug 16 at Desoto RV Park, Anniston Army Depot (ANAD). I called but was told the gentleman who manages the park was not available. I decided to stop in and check things out anyway. The security guard at the gate informed us that there were no vacancies and that due to the numerous permanent residents there rarely were. When I asked about the "two week on/one week off" standard MWR restriction, he told us that ANAD was not like any other installation and that the same rules did not apply. This just did not feel right to me. Isn't this why the RV park manager at Joint Base Lewis–McChord got fired a few years back? Previous reviews are spot on!! Best military facility we've stayed at so far. Small and private. Steve and Tina greeted us like old friends. Any questions we had were answered. Nearby city of Oxford has anything you may need including great golf. We'll be back. Thanks, Steve and Tina. Our GPS took us right to the gate and the campground was easy to find -- directions were spot on! It is not far off of the Interstate which was great for us as we were passing through on a longer trip. This is a small campground with most sites occupied by base employees. It is very quiet during the day since so many occupants are working on site. The host couple are very friendly, nice folks. We were greeted upon arrival and supplied with information about our hookups, local map and even information about the night's entertainment: Bingo and (optional) dinner at the rec building. Both cable and wifi worked great, and if you need help with hookups, Steve is very helpful. We had some issues with our vehicle and he helped us check out the problem and even gave us a boost and a mechanic nearby if we needed. The sites were full hookup, paved, and perfectly maintained; the restrooms and laundry room -- while basic accommodations -- were spotless with everything in working order. Laundry was $1.50 wash and $1.00 dry (and we removed our dried clothes, including jeans, before the cycle was even over). There was a nice playground near the campground. 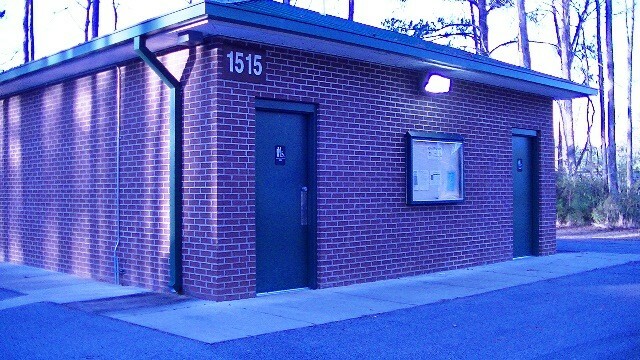 There is also a small pavilion next to the laundry building. For the price, this campground is a great value. The base itself has a small shopette and Anniston is nearby, as is Oxford which has about everything you could need -- including Sams Club, Walmart and the usual chain stores and restaurants. The only drawback for some may be that there is a train track beside the campground, but we were not bothered by it and my husband is a light sleeper. All in all, this was a great place to stay if you are passing through, visiting family in the Anniston area, or even close enough to go to the Talladega race! FOR RESERVATIONS CALL 256-235-6768 and not the number in the above information. This is a beautiful campground with long level concrete sites and plenty of space between units. Free wi-fi and cable. Each site has a picnic table, patio and grill. Nice walking trail around a small pond and several play areas. Located not far off I-20, close to several shopping areas and about 10 minutes from the Talladega Speedway. Forest surround one side of the pak so it is very quiet except for the occasional train. Small shoppette on base. Most of base is restricted but park is just inside the gate. Camp host here, Steve and Tina, are wonderful people and very helpful with local information. There are only 11 sites here with two marked for “short stays”, but we had no problem getting a reservation. We give this campground A “10”! Small campground, 11 spaces of which eight appear to be homesteaders. However, a two week advance reservation had no problems, and there was an open space all weekend. Host Steve is helpful and attentive. Roomy lots, concrete pads, large parking space, excellent WiFi and cablevision. All electric hookups, water,sewer. $16 per night is a bargain. I told the host I'd be up in the afternoon leaving, "No worry." No shade - the trees are cut back. There's room for more slots, whether they will be built is an openq uestion given the downsizing of the depot. Traveling I 20, or want to tour the Talladega track, this is the stop. Great little campground! Wonderful and helpful Campground Hosts! Sites have all hookups in lighted Pedestals at rear of large(40 ft)and level concrete pads. Sewer hookups are in the middle. 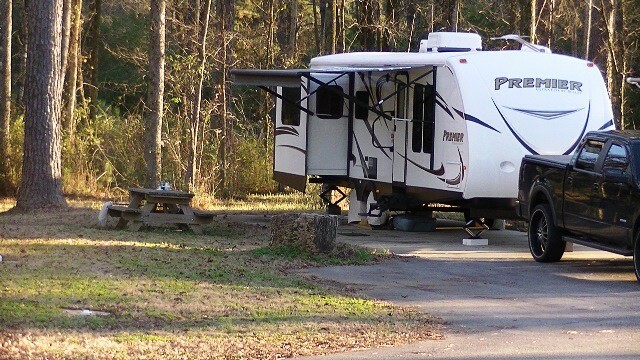 Large 2 Vehicle asphalt parking pads in front of each RV pad with a picnic table and grill. Bathhouse at end of campground is climate controlled but small with 3 Showers (1 handicap accessible), 1 each: Toilet, Urinal and sink on the Men's side and Women's has 2 toilets and 3 Showers (1 handicap accessible. Floor is currently plain concrete. The WiFi Router is on the Bathhouse, so the signal is little weaker at the other end of the campground, but acceptable. North sites are shaded and back up to woods and south are open not shaded. You have plenty of room between sites and you can circle bathouse when departing. 2 washers and dryers service. Gym, AAFES shoppette and Desoto Pastime Center(fast food) are within walking distance. Nice small pond with playground is nearby. Railroad is visible, nearby and trains are frequent. 1 site is keep for short term while 7 are permanent. Plans are in the works for 3 more pads. Close to Talladega AL, Cheaha State Park with highest point in AL (45 minutes away), and Chief Ladiga Rails to Trails Path ending in Anniston AL (continues to GA Border and on to Smyrna GA as the Silver Comet Trail) - a great biking trail. To clarify the driving instructions for first time Visitors: Once you make the second right turn, after you pass the first large parking lot on your left, as you go downhill and past a narrow grass berm between that parking lot and what appears to be another parking lot, but that second "parking lot" is actually an unnamed street that runs IN Front of Bldg 221 that has perpendicular parking in front of it - which is where you need to turn LEFT (behind the parked cars if a workday). If you miss that turn like I did, the next street for the White Oaks meeting retreat on the left leads to a parking lot that when empty is big enough to turn around in. There is no mail service at all or Commissary. 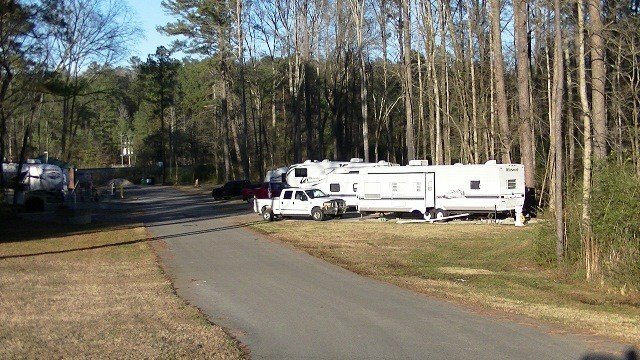 It's a great RV park to stay in, you will get use to the trains. Shopping mall in Oxford is not far away along with the exchange at mile marker 188 (I20). Coldwater creek is about 6 miles from Depot(1st turn left after Hwy 78 eastbound and Hwy 202 intersection) if your children like real cold water. It is very shallow(6 inches mostly). We called to see if a site was available to stay 1 night. Nothing was available. We stayed elsewhere, but visited the campground. Nice little campground in a corner of the base, located in the woods. Too bad it appears everyone there stays for long term. Some looked like they've been there for years. I plan to call and see what the length of stay limit is and how long it is to get on a "waiting list". Excellent prices - wish all military campgrounds would adopt this pricing, but limit the length of stay. Very nice location but be sure and call first according to the host only one of the eight sites are for traveling visitors as the rest are for folks working on post. Very nice full hook ups on concrete pad. Train runs directly behind the campground but wasn't a problem for us. Carol the host is very helpful. She stated there is a plan to add more sites but no specific date yet. Food Outlet just off post covers most needs and gas is available just off post. AAFES Shoppette has class VI items and some basics open Monday - Saturday. Great deal for $12.00 if you can get in. We have family in the Anniston area, so when we come up we try to stay here if they are not full. Never had any problems and Carol is the best. Our truck's engine blew up Thanksgiving 2009, and we had to purchase a new truck. Was not able to get the 5th wheel hitch until that Monday, there was no problem when I called to tell Carol we were not able to leave when planned. 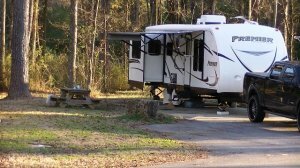 Campground is small but very clean and if I had to use the bath house there would be no problem, very clean and they have heat. Can't wait till they make the campground larger. If you want peace and quit this is the place. This well maintained CG is a great place to stop when traveling threw or for a couple of weeks to catch up on those things to do on the rig. Large Camping World in Anniston. Things to do if you want to drive a bit. Talladega Super Speedway 15 miles, Birmingham 40 miles and Atlanta about a hour and a half. Super market just outside the gate and another about 3 miles away. Laundry is about 12 miles away. The on base shoppette has minor items. Security is high so expect to have your Vehicles and Rig searched every time you go threw the gate coming back on the depot. Value is great Water/ Sewer/ 50 amp / cable for $12.00 per day. Carol and Bob the camp hosts are very helpful. This was my second visit to this park this summer, as I was on my way back east from the Texas Gulf coast. This is a hidden gem, small but friendly. If you are looking for quiet, inexpensive, but with easy access to I-20, try this little gem. C.H. left this review: Great little new campground! Wonderful and helpful Campground Hosts! Sites have all hookups in lighted Pedestals at rear of large and level concrete pads. Sewer hookups are in the middle. 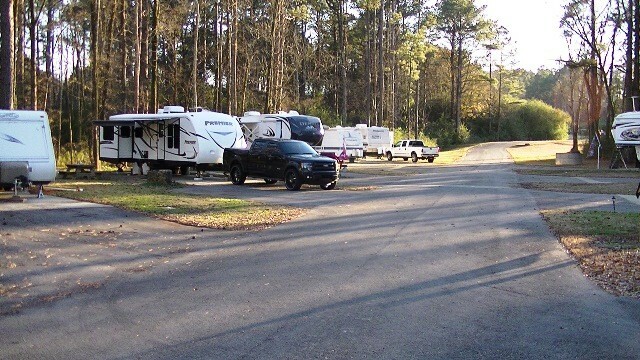 Large 2 Vehicle asphalt parking pads in front of each RV pad with a picnic table. Bathhouse at end of campground is climate controlled but small with 3 Showers, 1 each: Toilet, Urinal and sink on the Men's side. Floor is currently plain concrete. The WiFi Router is on the Bathhouse, so the signal is little weaker at the other end of the campground, but acceptable. Sites are shaded and back up to woods but are very close together at not quite 20' apart. No on-site Washer or Dryer service but AAFES Shoppette is within walking distance as is a Club. Railroad is visible, nearby and trains are frequent. 4 of the 8 sites were available while I was there, however MWR has rental trailers they move in and out and some guests are there semi-permanently. Hosts advised "long-term" policy will evolve as use/demand grows, and expansion of campground too. Close to Talladega AL, Cheaha State Park with highest point in AL (45 minutes away), and Chief Ladiga Rails to Trails Path ending in Anniston AL (continues to GA Border and on to Smyrna GA as the Silver Comet Trail) - a great biking trail. To clarify the driving instructions for first time Visitors: Once you make the second right turn, after you pass the first large parking lot on your left, as you go downhill and past a narrow grass berm between that parking lot and what appears to be another parking lot, but that second "parking lot" is actually an unnamed street that runs IN Front of Bldg 221 that has perpendicular parking in front of it - which is where you need to turn LEFT (behind the parked cars if a workday). If you miss that turn like I did, the next street for the White (?) meeting retreat on the left leads to a parking lot that when empty is big enough to turn around in. Great location for Mt. Cheaha State Park, Talladega Forest, Talladega Speedway, Speedway Hall of Fame and Logan Martin Lake. Pay close attention to the directions, especially the left turn right BEFORE bldg 221 or you will be unhooking your toad in order to turn your coach around. Signs are needed to guide campers into the facility. There is a turnaround at the bath house, a bit tight but manageable in my 42 foot MH. Nice setting, tall trees but enough openness to get satellite in most spots. Small park, only 8 spots, but as yet undiscovered, so there is availability. The hosts, the Browns, are wonderful, very friendly and helpful. 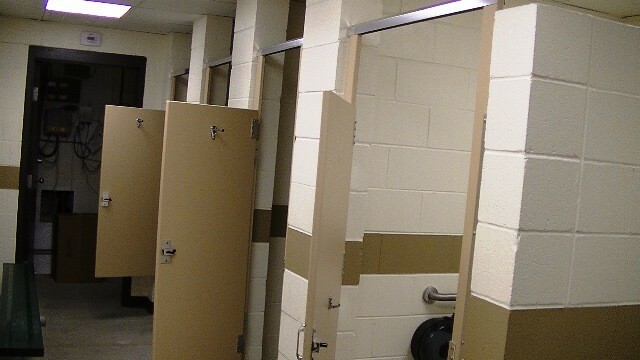 The showers/restrooms are spartan but clean. There is a shoppette and club within walking distance of the campground. Be aware there is a CSX railroad at the edge of the campground. I didn't notice it, but others may be bothered. I planned on only staying 2 days, but stayed a week. Great weekly rate and monthly rates here. Overall, a good value if traveling along the I-20 corridor in NE Alabama. A great value if going to the Speedway for the Sprint Cup. I camped here in a motor home.